"The Nothing is a big place," I said without fear of understatement, "and mostly empty. Theoretical storyoloists have calculated that the readable BookWorld makes up only twenty-two percent of visible reading matter - the remainder is unobservable remnants of long-lost books, forgotten oral tradition and ideas still locked in writers' heads. We call it 'dark reading matter.'" The blurb for Dark Reading Matter (below) is very spoiler heavy if you're not caught up on the series do avoid it, but check out my essay on why I love this series to get in the know. The Bookworld's leading enforcement officer Thursday Next is four months into an enforced semi-retirement following a near fatal assassination attempt. She returns home to Swindon for what you'd expect to be a time of recuperation and rest. If only life were that simple. Thursday is faced with an array of family problems - her son Friday's lack of focus since his career in the Chronoguard was relegated to a might-have-been, daughter Tuesday's difficulty perfecting the Anti-Smote shield needed in time to thwart an angry Deity's promise to wipe Swindon off the face of the earth, and Jenny, who doesn't exist except as a confusing memory. If you thought dealing with the Bookworld could be hard, wait until you see what it takes to be a mother. Fforde's second YA Dragonslayer book The Song of the Quarkbeast was just released in the UK to tide us all over for our Fforde fix. I for one can't wait for the sequel of Shades of Grey though. That was a simply marvelous read all around. Couldn't resist posting this one. Two of my greats loves combined. To enter send an email to madhatterreview (AT) gmail (dot) com with your full name and snail mail address in the body and "RIYRIA" in the subject line. The deadline is midnight November 30th. I'll announce the winners on the following day or as soon as I remember. This contest is open to US, Canada, and the UK only. If you send multiple entries you will be disqualified from the contest. The winner will be selected via random number generator per usual. 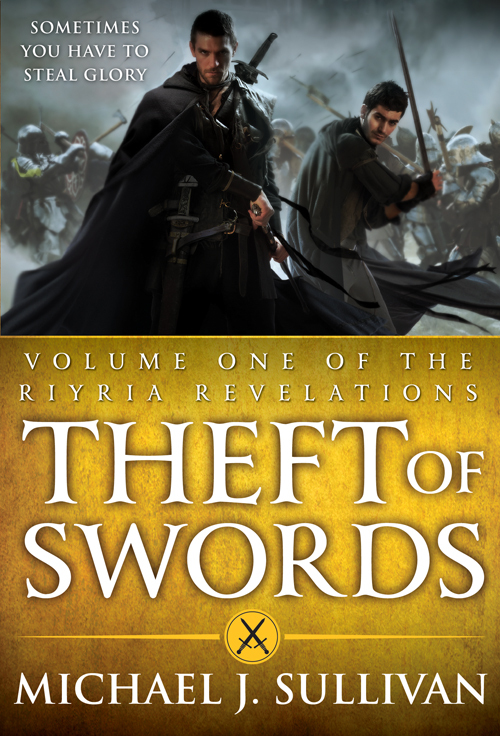 Look for my review of Theft of Swords later this week and a treat from Mr. Sullivan tomorrow. I'm a bit late in getting this up, but hey, I'm on Thanksgiving break. China Mieville's next release is Railsea, for which very little is known, but much is inferred. 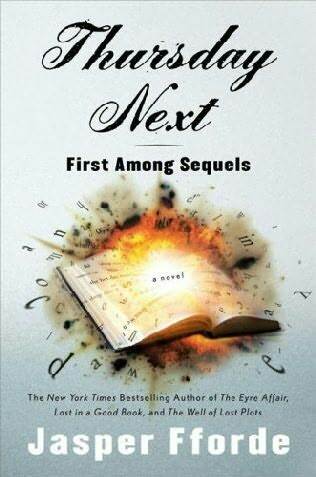 Most say it is his next YA release, which feels right given the price and cover. It definitely seems to be in the vein of Paolo Bacigalupi's work, which would be fine by me. 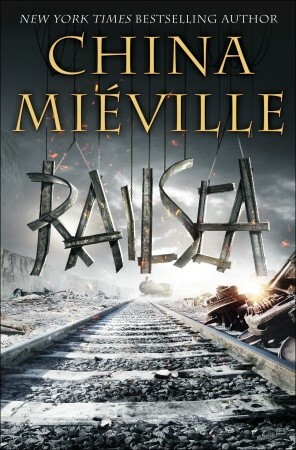 What is know is that Railsea will be out in May, which shows again Mieville is keeping up the year a book schedule. Even though I thought Mieville's last release Embassytown showed brilliance I still felt it lacked something, but even his most disappointing work kept me with him until the end and his first YA novel Un Lun Dun, while not as deep as his other works hit the mark with me. Ah, October. What a busy, crazy month you've been. Things have just about normalized for me at home, but during this time I decided it was time to get to a few books I've been meaning to read for a while including a couple that have been on my shelves over a year. 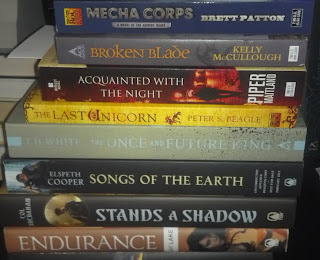 It also turned out to be a Steampunk heavy month, which I hadn't planned on. 92. 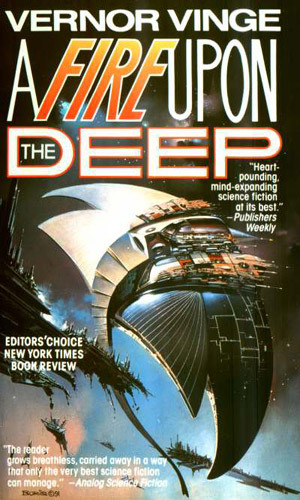 A Fire Upon the Deep by Vernor Vinge - How have I been able to call myself a Sci-Fi fan without having ever read this book? It's genius on so many different levels. Yes, it can be a bit long winded, but when I reflected there is nothing that should have been cut as it all adds to the texture of the future Vinge creates. From the pack-mind beings to the omnipresent beings inhabiting the far reaches of space this is book that succeeds in seeding our thoughts about the possibilities of the mind and the future. 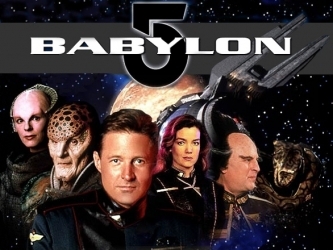 Highly recommended and a surefire can't miss if you're a Sci-Fi fan. 93. 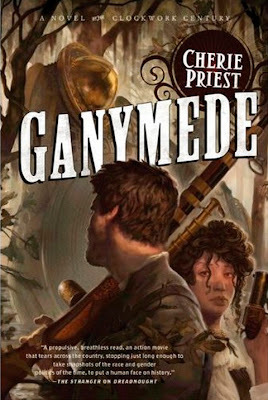 Ganymede by Cherie Priest - This is my favorite book in the series since Boneshaker. I might be a bit biased on this one though as I'm a big fan of New Orleans and much of the story takes place there. Unlike the first 3 Clockwork Century stories that standalone well for maximum effect I wouldn't start here as there are many connections between previous books including some pretty main characters. Highly recommend series. 94. 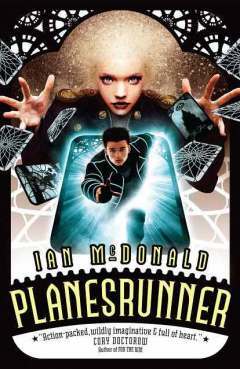 Planesrunner by Ian McDonald - Part of Pyr's YA debut season. 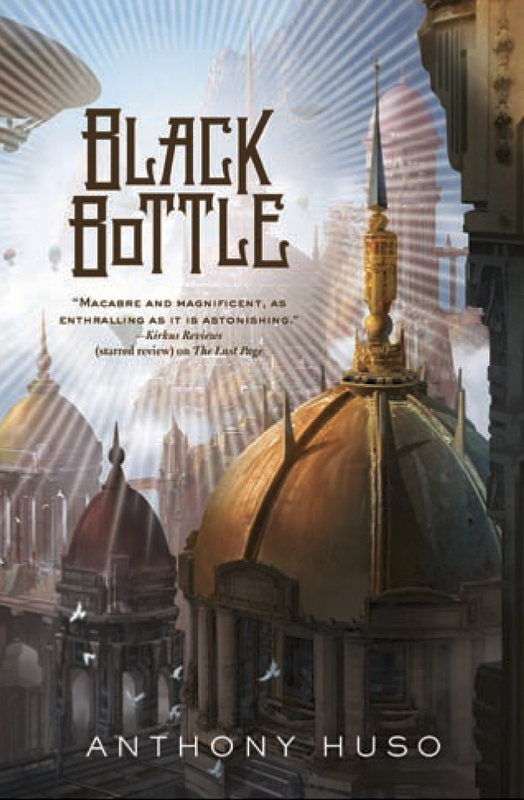 Much of this ground has been tread upon by the likes of Gaiman and Reeves (Interworld) and Philip Pullman (The Golden Compass) yet McDonald brings his own sensibilities and more international flair into the fold that enlivens the story and characters. I especially appreciated the use of a variant of the thieves cant and how each world has its own personality. 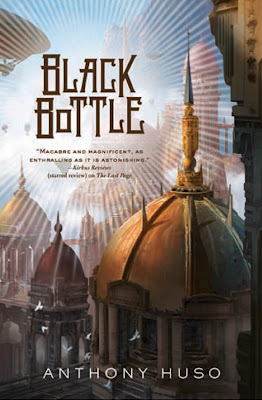 There is even a slight Steampunk bent on one main world, which makes more sense technologically than explanations in most other Steampunk reads. This is definitely much more accessible than McDonald's adult work. Recommended and my niece will certainly be getting a copy. 95. 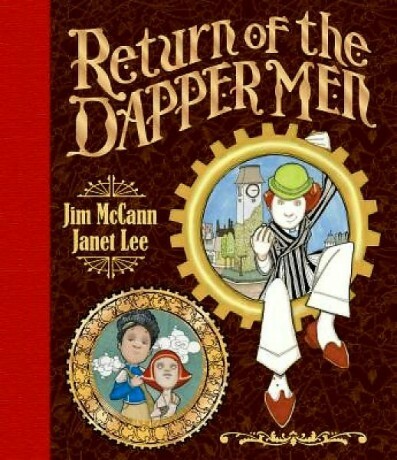 Return of the Dapper Men by Jim McCann & Janet Lee - It is no wonder that this graphic novel is an Eisner winner as the story and gorgeous art will take you away to a city inhabited by children living below ground and automatons living above ground while men with hats fall from the sky. Yes it is an odd one. I was greatly reminded of The City of Ember in that the people of the city have forgotten their history only with a much more magical edge. Highly recommended. 96. 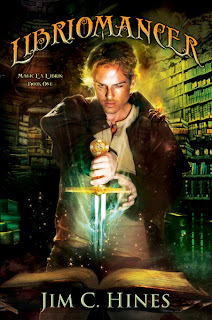 Rosemary and Rue by Seanan McGuire - This year has been something of a dry spell for me in the Urban Fantasy area. There have certainly been some solid reads - Awakenings, Low Town, and Hammered to name a few - but none have wholly captured me like McGuire's debut which is now a couple years old. I'm quite smitten with Toby Daye the half-breed fairy protagonist detective. Awesome world building and use of traditional fairy mythology in a different way. The first person detective angle is pulled off quite well. Highly recommended. I'm hopeful the rest in the series holds up so well. 97. Locke and Key: Welcome to Lovecraft by Joe Hill and Gabriel Rodriguez - Hill continues to awe me with his writing abilities and his first crack at a comic series is simply amazing. It is dark, magical, and endearing all at the same time. 98. Locke and Key: Head Games by Joe Hill and Gabriel Rodriguez - This is the point in the story where things get weird and the magical keys start showing up more and more. 99. Theft of Swords: The Crown Conspiracy by Michael J. Sullivan - The start to a very enjoyable Sword & Sorcery series coming out in Omnibus format very soon. The Crown Conspiracy is the first book in this omnibus and I'm already and the second. Review to come. Although, October is one of the worst reading months for me numbers-wise it had to be one of the most solid months reading-wise. Every book was well worth the time I put into it. Out of everything A Fire Upon the Deep is as good, if not better, than I hoped. It is without a doubt a Sci-Fi classic. Rosemary and Rue scratched the UF itched I had and Theft of Swords was good old-fashion fun. 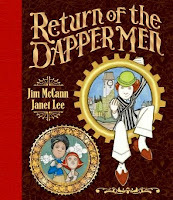 And this isn't even getting into how great Locke and Key and Return of the Dapper Men were. So yeah, if you check out any of the above you shouldn't be disappointed. Ah, more pretties have entered my stacks. First up as usual our the books I've bought. 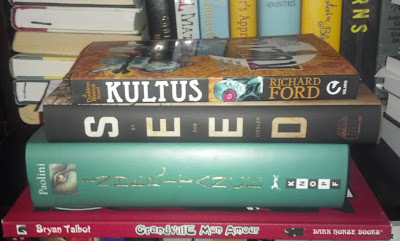 Kultus by Richard Ford, which I believe is Ford's debut outside of his Warhammer books. 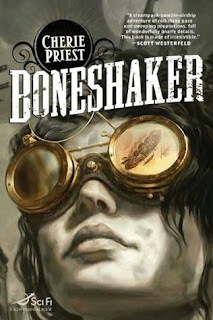 And it is Steampunk no less with a character wielding demonic powers chasing a mysterious key. Seed by Rob Ziegler is a debut I've talked up a bit, but up until this point I've only read a few chapters. Those few chapters though inspired me to interview Ziegler. That thick green member is Inheritance by Christopher Paolini that I'll fit in around the end of the year. Fingers crossed that it closes out strong. Lastly is the graphic novel Grandville Mon Amour by Bryan Talbot, his second collection for the Steampunk Anthropomorphic animal detective series. Mecha Corps by Brett Patton is a debut about soldiers in as the title suggest mecha suits that could be fun, but the cover isn't doing much for me . Broken Blade by Kelly McCullough is the start to a new Fantasy series that is about the skinniest Fantasy book I've seen in years. Acquainted with the Night by Piper Maitland looks to be in the Da Vinci Code vein only a bit sexualized. Next I've got re-releases of two classics: The Last Unicorn by Peter Beagle and The Once and Future King by T.H. White. I've read the former, but not in many years so a re-read is in order and never the latter which is a great shame I hope to rectify in the next couple of months. Songs of the Earth by Elisabeth Cooper made a lot of noise from its UK release earlier this year and the US is finally getting a shot. Stands a Shadow by Col Buchanan is the sequel to Farlander that had some nice moments, but didn't win me completely over. As the news spreads, Stonehold—long considered unimportant—comes to the attention of the emperors in the southern countries. They have learned that the seed of Sena’s immense power lies in an occult book, and they are eager to claim it for their own. 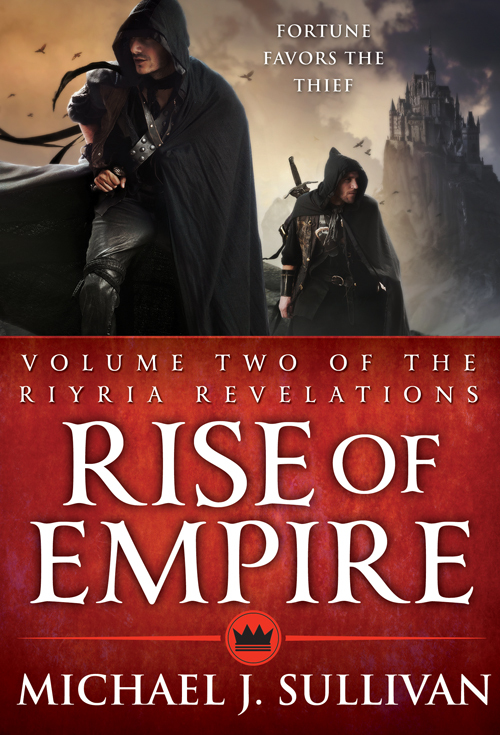 Desperate to protect his people from the southern threat, Caliph is drawn into a summit of the world’s leaders despite the knowledge that it is a trap. As Sena’s bizarre actions threaten to unravel the summit, Caliph watches her slip through his fingers into madness. Brandon "The Machine" Sanderson's latest novel The Alloy of Law was just released and it was accompanied by a well made fan trailer to boot. 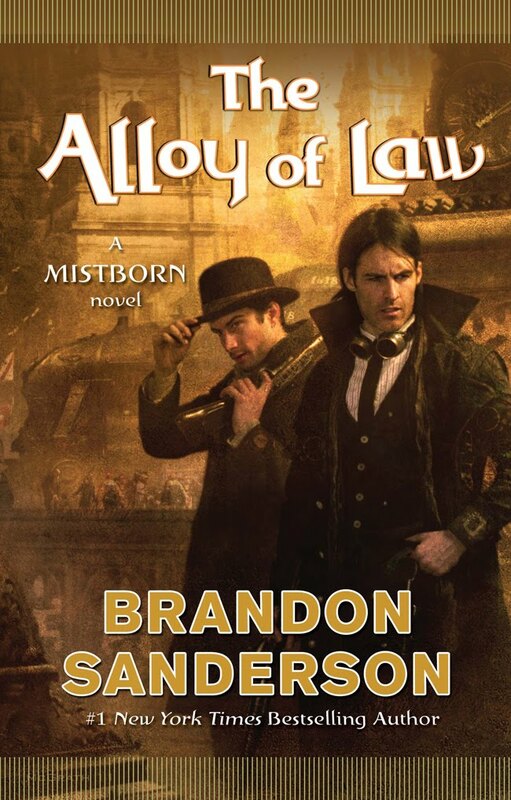 The Alloy of Law is placed in the same world as the Mistborn trilogy only pushed ahead into a more Western age. 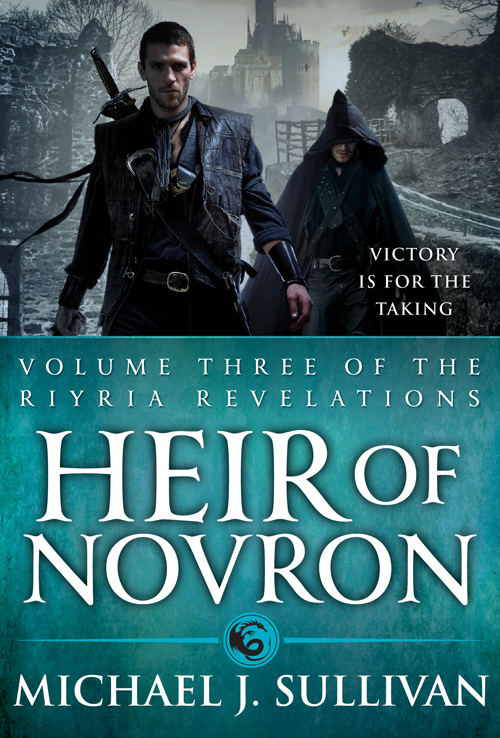 Neth also did a great interview with Sanderson for those wanting to know a bit more about how this novel connects with the others and future plans for the Mistborn world. I hope to get to Alloy before the end of year, but I'm not sure at this point as I'm trying to get to a few more debuts (Seed/The Night Circus) and long-awaited novels (The Magician King/The Iron Jackal) during that time. Plus Larry just set a challenge in my direction that I'll be answering. 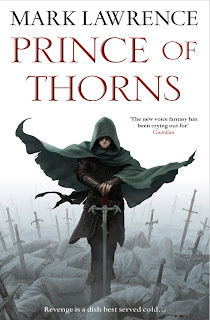 Right now I'm about a third through Mazarkis Williams' debut The Emperor's Knife and so far I'd put it in the near the top of Fantasy debuts of the year as it reminds me of Daniel Abraham crossed with Brent Weeks, but we'll see. Some people would say it’s a bad idea to bring a fire-spider into a public library. They would probably be right, but it was better than leaving him alone in the house for nine hours straight. Smudge was a neurotic little arachnid, but as long as he had company, he usually refrained from setting everything alight. So, yes everyone's favorite fire spider from the Jig the Goblin books is making the cross over. 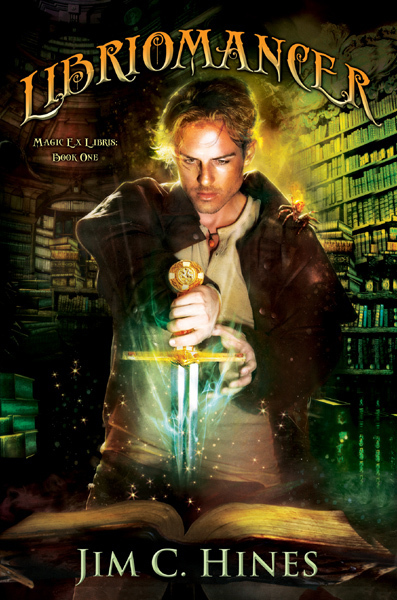 Libriomancer will be out in August from Daw and marks Hines' first hardcover release. Also of note is that the Jig the Goblin books are being released in omnibus format. The collection will be called The Legend of Jig Dragonslayer and will be out in July.